The Catholic Church had some of her Jesuits write on the subject of eschatology as part of the Counter Reformation. 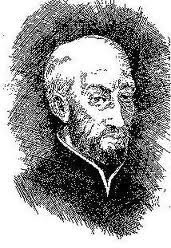 Francisco Ribera (1537-1591) was a Spanish Jesuit, a doctor of theology who wrote a 500 page commentary on the Book of Revelation. His commentary placed the Tribulation at an unknown future date. And, he also agreed with the early Christian writers that the Church would be persecuted for a literal 3 1/2 years. However, to these truths, he also added something -- time. The Lord Jesus, Paul, and the early Church had all stated that the Rapture would occur AT the Revelation, as a single event. The Lord would descend from heaven to the earth’s atmosphere, call up his Church to the clouds, and then continue to the earth to fight against his enemies. Ribera stated that the Rapture would occur 45 days before the end of the Tribulation. The Church would ascend 45 days before she came back down with Christ. This is the first known instance where the Second Coming was split into two separate comings! And it was conceived of by a Jesuit priest. 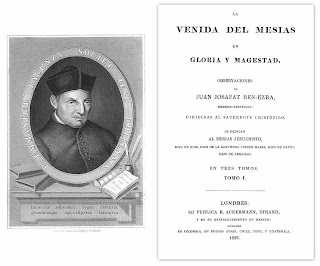 The manuscript that he wrote was titled, The Coming of Messiah in Glory and Majesty. In 1812, he published a book in which he theorized that the church would be raptured some 45 days before the real return of Jesus to the earth. (He was probably influenced by Ribera.) He also theorized that during this same 45 day period, while the Church was in heaven with the Lord, God would judge the wicked still on earth. Because of his Jewish alias, his book was more easily accepted by Protestant scholars. When it was placed on Rome’s Index of prohibited books, it was even more sought out by Protestants. Let's see where we are so far. 1. The Doctrine of Imminency - which is rooted in the allegorical method of interpreting the Scriptures as first proposed by Origen and then later made by popular by the Catholic theologian Augustine. 2. A Split Second Coming of Christ - which is rooted in the teachings of two Catholic Jesuit priests. And it will only get better!